Born in New York City just before America became a country, Elizabeth grew up in a prominent family. She fell in love, married and had 5 children. Their happy life was soon shattered by money trouble and sickness and then her husband died young. Friends showed her the beauty of the Catholic faith and she became Catholic. This did not make some of her friends and her family happy because Catholics were looked down upon in New York at that time. Most of them turned their backs on Elizabeth, but she never regretted her decision. She packed up her children and moved to Baltimore where she opened a Catholic school. It was a great success and Elizabeth decided to dedicate her life to Catholic education. With the help of America's first bishop, she founded the first congregation of religious sisters in the United States. As more sisters joined her, and the school grew, they moved to Emmitsburg, Maryland to expand and bloom. Elizabeth had laid the foundation for the wonderful Catholic education system our country enjoys today. Elizabeth relied on God no matter what and her deep faith grew along with her mission. She was only 46 when she passed on to Heaven. In her short life, she had been a wife, a mother, a widow, a convert, a nun and a foundress. She helped to weave the fabric of our country at its very beginnings. 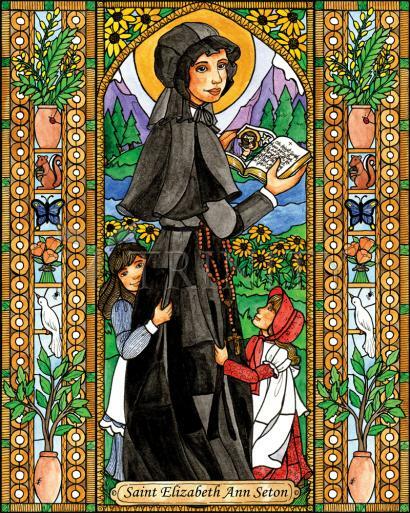 Her feast day is January 4.